You are here: Home / About Hanukkah / What Is Hanukkah Gelt? Hanukkah is a Jewish holiday with many fun traditions that are eagerly anticipated by children and adults alike. One that most children look forward to eagerly is receiving Hanukkah gelt, or money. Today, most coins are made of chocolate and are wrapped in gold or silver foil. Not only are they fun “money” to play with, but they are also delicious to eat! Hanukkah gelt and a dreidel. Hanukkah gelt, however, wasn’t always made of chocolate. “Gelt” is a Yiddish word meaning “money” and once, children actually received real money on Hanukkah. However, their parents were not just giving them pocket money to spend. Hanukkah gelt has always been more than just a fun gift – it is also about teaching the children. The Hebrew word Hanukkah shares its root with another Hebrew word, “hinnukh,” which means “education.” Parents would give their children money on Hanukkah as a way of educating them about the importance and value of education. The children would take their money to school and give it to their teachers as a sort of holiday bonus. This helped teachers get by on their salaries and helped teach children to appreciate their education. Parents would also give their children some extra gelt to keep for themselves as a reward for doing well in school. In this way, children learned saw immediate rewards from their studies and were encouraged to work harder. 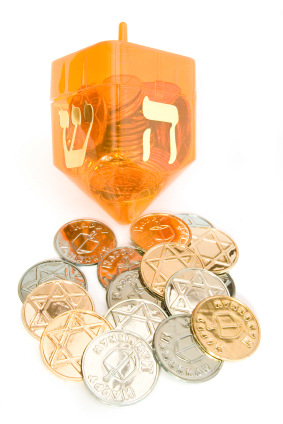 Today, Jewish parents also use gelt to teach their children about the value of money and the importance of charity. Some parents use gelt to show their children just how much things cost, rather than simply buying them gifts. When children have to choose how to spend their money and they only have a limited amount, it encourages them to choose more wisely and spend more carefully. Jewish parents also use it as an opportunity to teach children the importance of giving charity. Children are encouraged to take 10% of their new gelt and give it away to charity immediately, so they learn the importance of helping others. Finally, gelt has a strong historical and spiritual importance in the story of Hanukkah. When the Greeks invaded Israel, they did not try to eliminate the Jews or destroy their possessions, they instead tried to convince people to use what they had for superficial uses instead of spiritual ones. When the Jews finally won their freedom back, they were again able to use their wealth for spiritual purposes. In this way, giving gelt on Hanukkah teaches children that money is connected to spirituality and a higher purpose. Today, however, most Hanukkah gelt is made of chocolate. It is often used when playing the game of dreidel and children trade and share it. Most of the time, though, children simply eat and enjoy it! At the end of the day, Hanukkah gelt is just one more aspect of the holiday that makes it fun and exciting for everyone. Jewish holidays are meant to be celebrated with a festive spirit and in the Hanukkah celebrations, gelt is a big contributor. So enjoy giving and getting your gelt this year and have a happy Hanukkah!